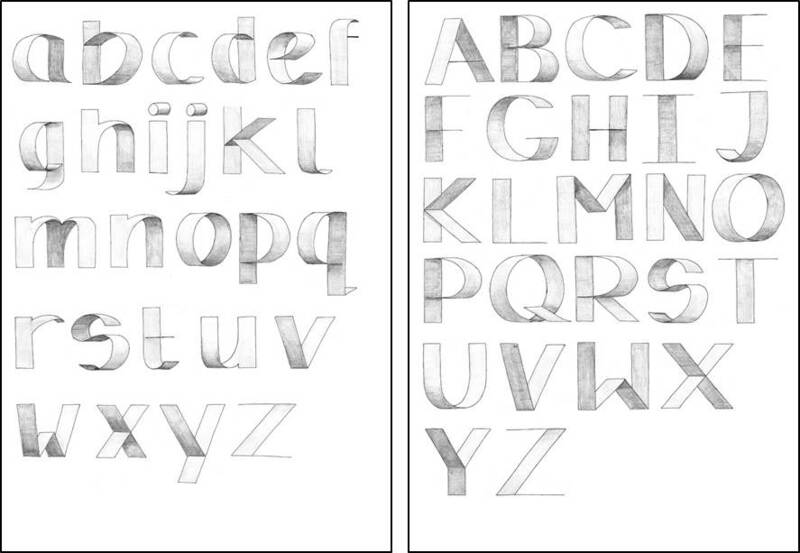 The letters are shaded in to give a 3D effect and demonstrate how the lines are perceived. Depending on how the lines are perceived depends on whether the characters appear to come forward or go backward in perspective. Each letter considered individually can create a lack of continuity, with a mix of characters appearing to go in different directions. We had a class introduction to block printing or ink etching. 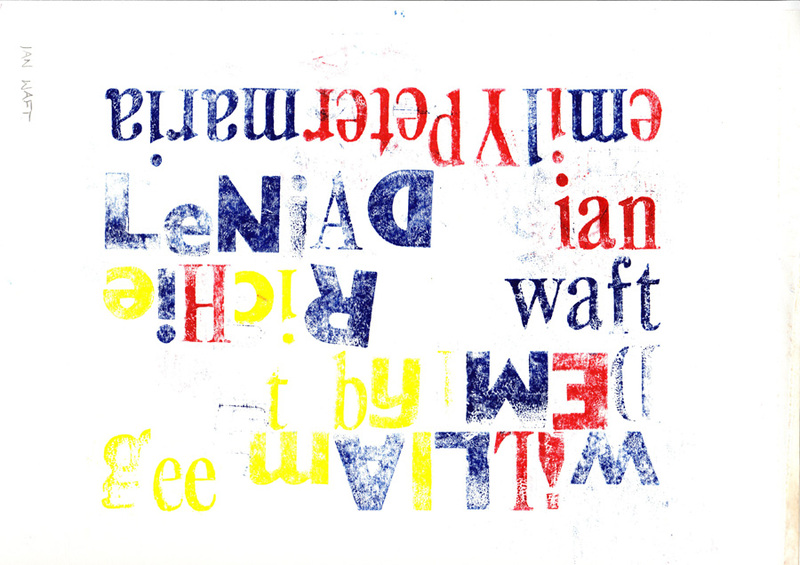 Choosing letters from wooden block fonts and rolling coloured inks across them and pressing a medium of paper or cardboard etc onto the set block work. Our set homework was to take pictures which included font. We were then grouped into fours. Each of us choosing one of our pictures we used Photoshop to create a single A3 compilation of our chosen four images. This image was then separated out into individual colours of Cyan, Magenta, Yellow and Black. 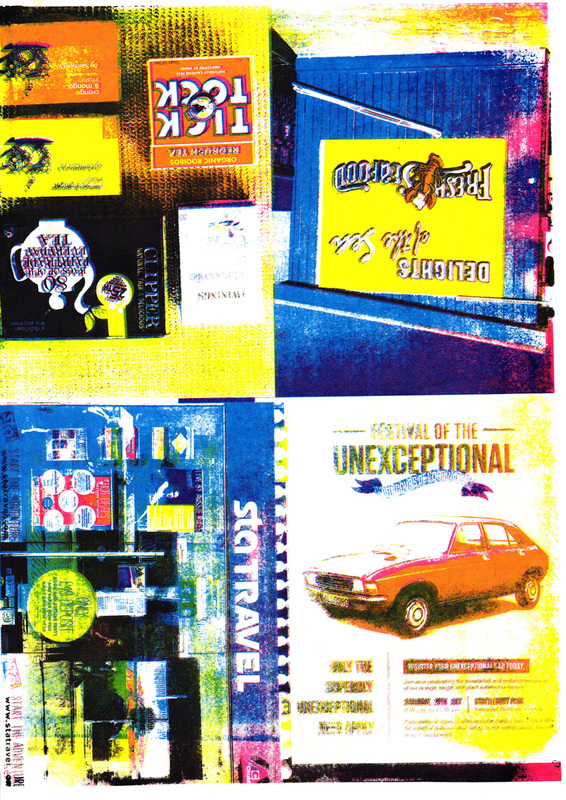 Each colour is represented as individual grey tones images and these four images were printed out. In reality these grey tones are made up of varying density of fine black dots or lines produced by the digital printing process. In screen printing the ink will be pressed onto paper where these dots or lines occur. Four large screens are coated with a UV sensitive compound at least one hour prior to needing them and are left in a darkened room. 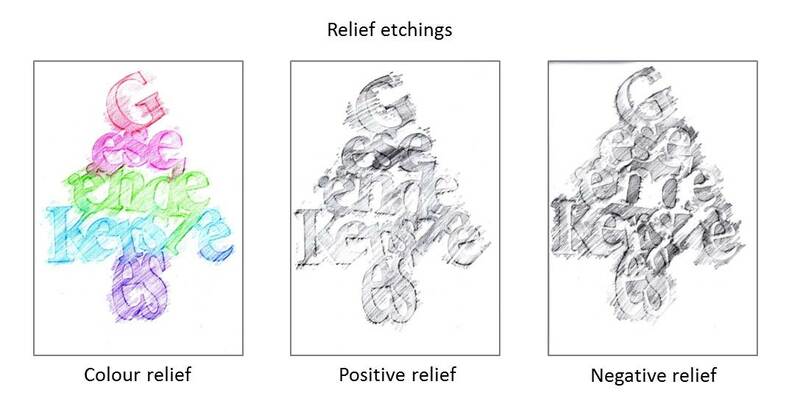 Baby or vegetable oil is applied to the four images so that paper becomes semi-transparent, much like tracing paper. This allows UV light to pass through the white areas of the image. The excess oil is removed using blotting paper. This prevents the surface of the paper being shiny, which would reflect the UV light when the image is exposed. Each screen is placed in turn on the UV light unit with the respective image contacting the screen. The vacuum ensures the image and screen are held together for a sharp exposure, and the image is exposed to the UV light for approximately 40 seconds. Where there is white in the image, the UV sensitive compound hardens and sets, where there is black the compound remains unset. The unset compound is then washed away using a cold water shower head. The screens are left a while to dry off, the edges are taped up with gum tape, along with any unwanted exposed area. 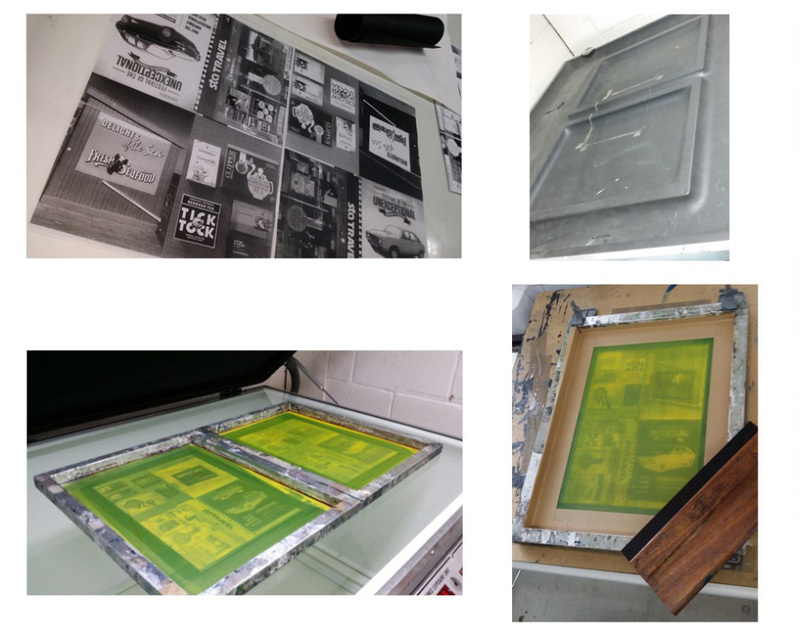 Using a hinged clamp, each screen is in turn registered and placed ready for printing using inks. Each colour is mixed with a medium to slow down drying and prevent clogging of the screen mesh. This mixture is spread across the top of the screen and the Squeegee used to press the colour through the screen onto paper (or other medium). This is then left to dry whilst the screen is cleaned. 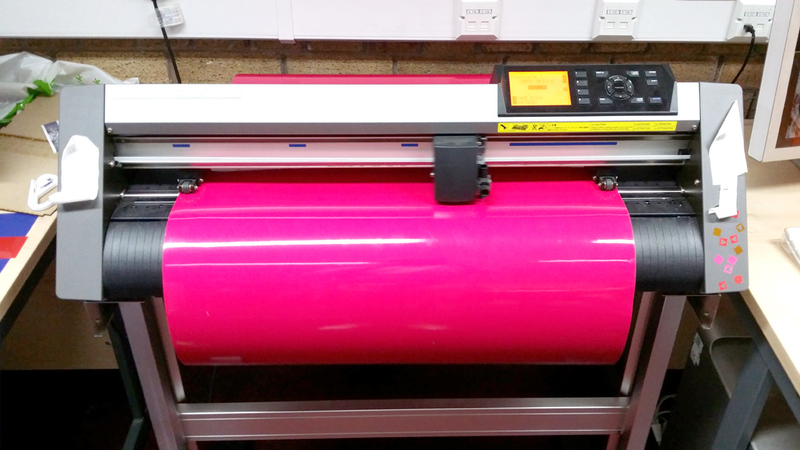 The above process is repeated for each screen and colour needed until all four CMYK colours have been printed. Using Illustrator we created 6 letter forms in 14cm X 14cm boxes. 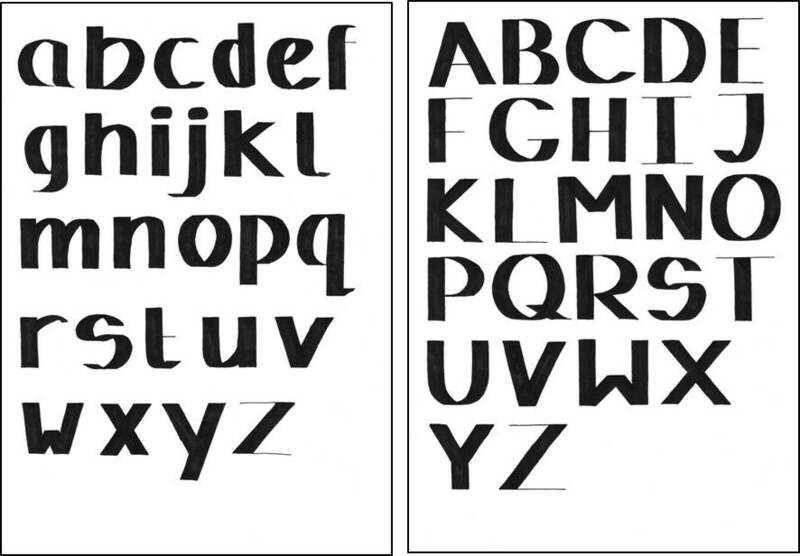 These were a mix of Serif, Sans serif, Black letter and Cursive fonts. Each font was increase in size, moved, rotated and placed in the boxes in a way that pushes our ability to recognise each letter. These letters were printed and each one traced out using layout paper. The traced drawing is then layered onto a choice of black on white or colour on colour card. With a steady hand and a sharp knife, the layers of card were cut out in the shape of the letters. These cut-outs were then glued back onto card with the font and background colours mixed up. 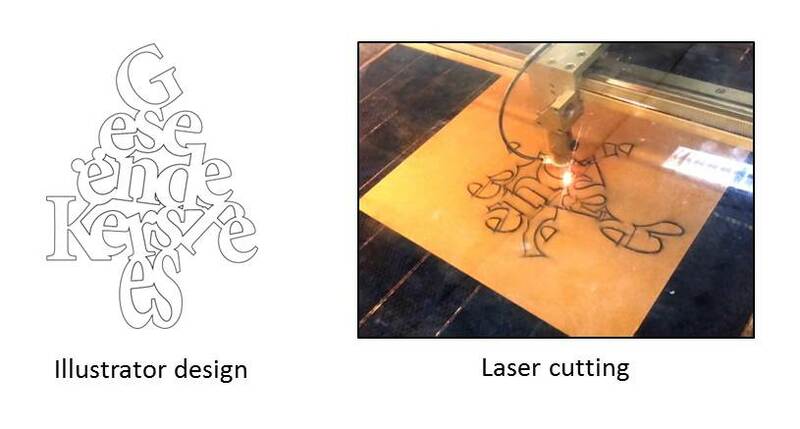 The laser cutter can import a black and white image, Photoshop or Illustrator file, or something similar and calculate paths to burn through, or etch into a variety of materials. Typical materials used include acrylic, wood, paper, metal, plastics, glass, leather, stone and more. The settings allow for the adjustment of intensity of laser and cutting time, which in turn determine the depth of the cut for any given media. The varying depth will determine the depth of etching from light, to a clean cut all the way through. The cut is precise and allows for complicated designs to be achieved with relative ease, as most of the work is done using design tools and the laser making quick and light work of the hard part. 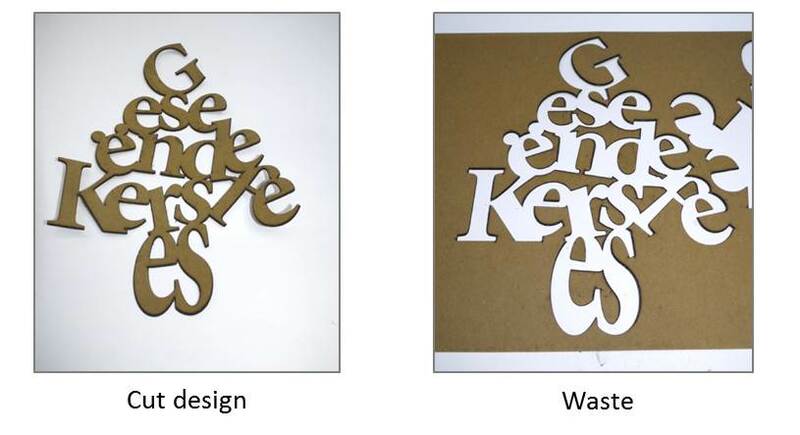 For our introduction to laser cutting, we used the outline of designed, overlapping letter form, with an Xmas theme. 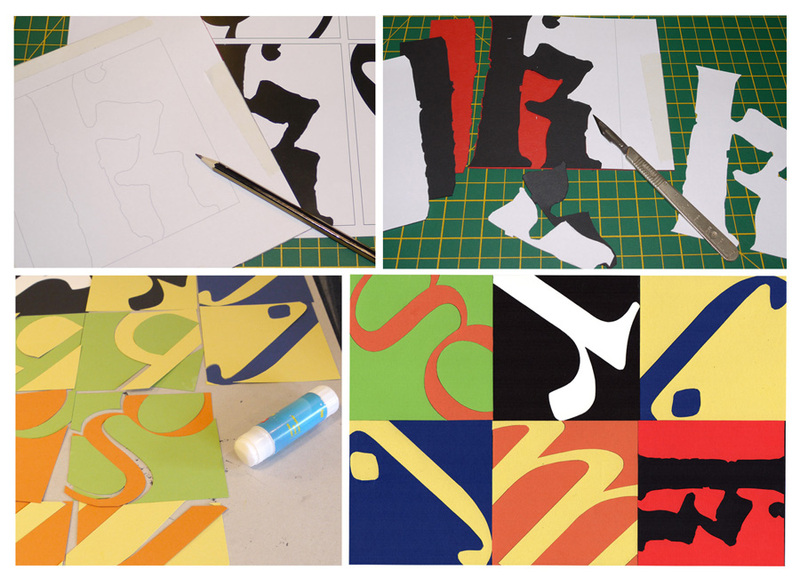 In groups, we each cut letter forms from a 3mm thick MDF board. To achieve a good clean cut, the depth of the laser was set to 6mm. The need for this is likely down to the density of the board. Once cut the unwanted pieces were punched out and discarded. I had intended to use these in some other manner. I also used the paper cut form to experiment with colour and pencil relief etching, with some success. 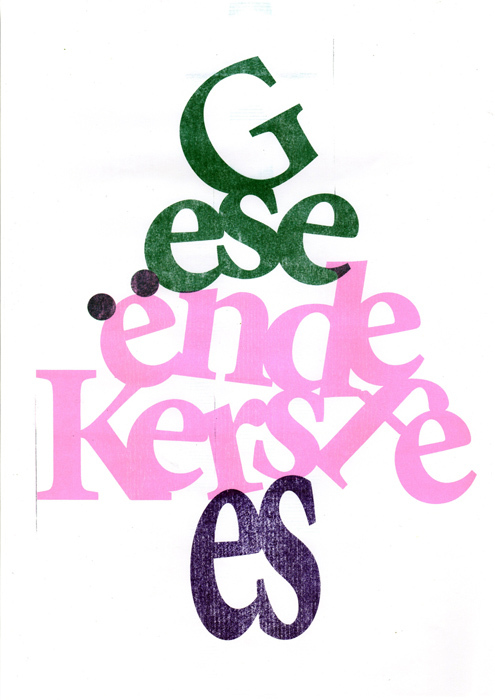 RISO printing feels like a mix between photocopying and screen printing, using a quick, clean mechanised process. This unit looks like a dated piece of freestanding office equipment. The Risograph seems to be developed from the concept of the mimeograph machine, a hand driven process much used during my schooldays for hand-outs. The process allows large numbers of images to be produced in a short period of time and is said to have been considerably cheaper than colour photocopying and printing. Similar to screen printing, the overlapping ink colours combine to produce additional colours. What happens inside the machine feels like a mystery to me. To an operating layman, the process consists of some basic elements. 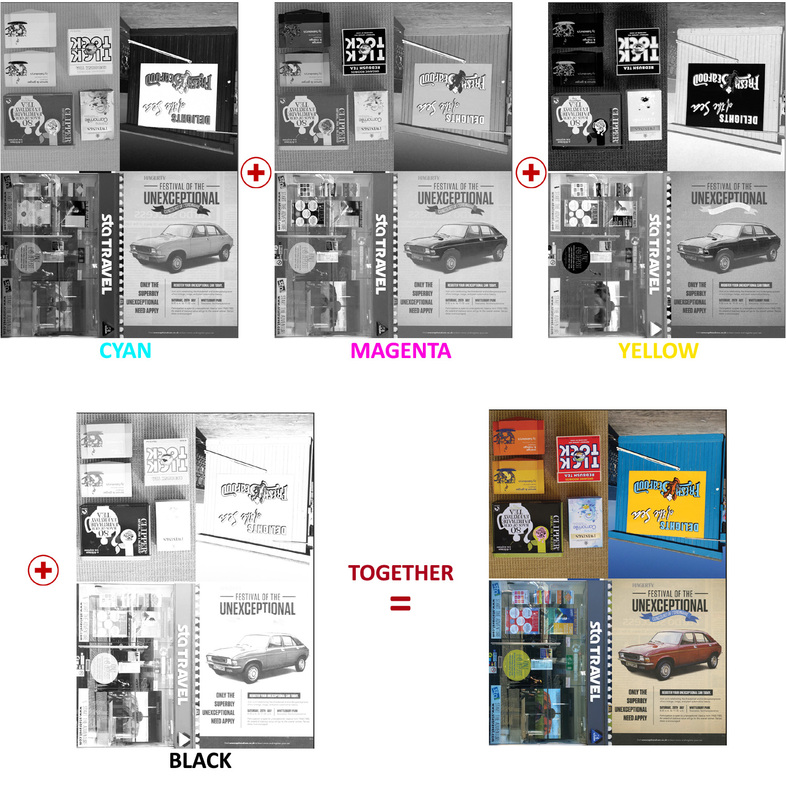 For each colour to be printed, a printed greyscale image is required. Each colour ink cartridge looks like large piston driven, ink filled cylinder. The unit holds one colour cartridge at a time and this must be replaced for each colour required. With the chosen ink colour installed at the front of the unit, the corresponding greyscale image is placed on the scanner bed. Much like a photocopier, from the menu, a master sheet is produced. This is done by burning tiny voids through the sheet from a thermal plate. The master sheet gets wrapped around a drum. As paper is fed into the machine, the drum rotates and ink is forced through the tiny voids onto the paper. Once satisfied with the master, the required number of copies is selected and speedily processed through the machine. The density of ink can be adjusted through the menu. Ideally, time should be allowed for the ink to dry before the printed stack is fed back into the machine. Wet ink can transfer onto the paper feeding drums and can contaminate the following copies. If this happens, the drums need to be cleaned with the relevant cleaning solution. 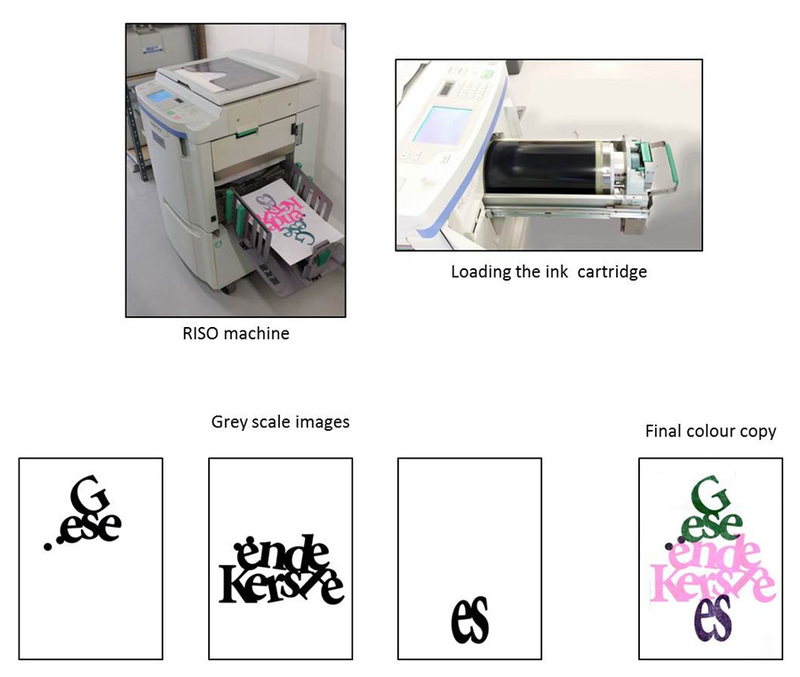 The colour cartridge is replaced with the next colour and the corresponding grey scale image placed on the scanner bed. The process is repeated for each colour required for the image. Registration of colours is achieved through a combination of accurate placement of the image on the scanner bed and fine movement of the printing mechanism through the menu system. Registration marks can also be added to the image. Printing onto different paper will give varying results. A vinyl cutting plotter is a plotting machine with a sharp pointed blade. The cutter is able to cut vinyl at a depth that does not cut the backing sheet. This allows the vinyl to peel off the backing sheet and to be adhered to a variety of prepared surfaces. A role of vinyl, of a chosen colour, is loaded into the back of the plotter and fed between the rollers. The plotter effectively moves the vinyl role back and forth, whilst the blade slides along the guide pressing against the roller. This allows the blade to follow the contours or paths of the designed graphic. The vinyl is cut in the shape of the design. Once the cut is complete and the vinyl is removed from the machine, the unwanted segments of the design are peeled from the backing and discarded. This part of the process is referred to as weeding. The graphic now needs to be transferred to the intended substrate. In this case it happens to be CKW020 and CKW013 studio windows. Transfer tape is applied over the graphic, and smoothed down with the aid of a squeegee applicator. This transfer tape helps keep the graphic in position. The chosen window is cleaned in preparation with a solution that also helps the vinyl adhere to the glass. 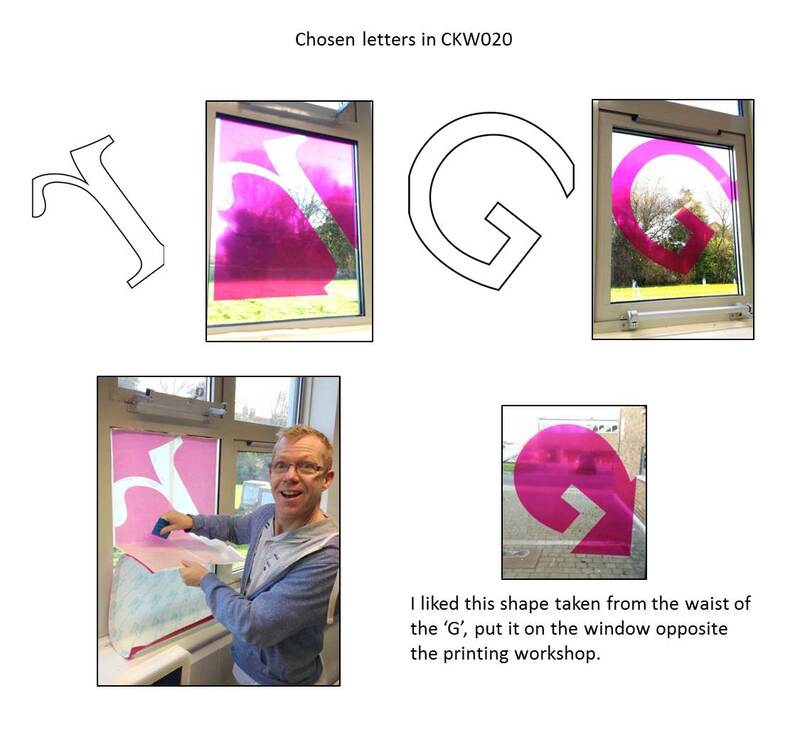 The graphic is lined up with the window, once happy, the backing sheet can be peeled back, and the graphic tacked to the window. Smooth down the graphic using a squeegee applicator, removing air bubbles and creases. The backing sheet can be peeled back as you move across the graphic. Once on the window, the backing tape can be removed, any small bubbles chased out, and the job is done. Vinyl cutting is a quick and easy method of producing graphics for advertising. It can be used almost anywhere; shop windows, side of vehicles, signpost etc.